Today, a global coalition of economists and activists release a 200p report on a variety of initiatives to leave “unburnable” fuels in the soil. The EU funded EJOLT network studied a range of campaigns and innovative proposals that aim to stem the flow of crude at the source. On May 9, for the first time in human history, global concentration of Carbon Dioxide crossed 400 ppm. “Unburnable fuel” is now a buzz phrase referring to the calculation that if more than 20% of the world’s reserves of coal, oil and natural gas were combusted, run-away climate change is all but certain. The report shows how and where the process of leaving fossil fuels in the ground should start, beginning in some of the most pristine places on the planet. Bill McKibben’s “Do the Math Movie” and the 350.org fossil fuel disinvestment campaign have recently gone viral. They highlight how markets are overvaluing oil companies, whose share price is based on reserves that can never be burned. But creative resistance to the fossil-fuel economy goes way back. “It is time to listen to constructive initiatives coming from the peoples who have suffered most from oil extraction. They have great ideas on how to leave oil in the soil, coal in the hole and gas under the grass.” says Joan Martinez Alier, a professor at the Autonomous University of Barcelona (ICTA-UAB). This report is made up of contributions from activists and academics who have either spent years documenting the struggles or are members of Environmental Justice Organisations fighting for environmental justice. In 1995, the Ogoni from the Niger Delta managed to expel Shell. Their proposal to “leave oil in the soil” was picked up by the Nigerian based Environmental Rights Action. Then in 2006, the Ecuadorian organisation Acción Ecológica proposed to leave in the ground 850 million barrels of oil from the ITT wells, located in the Yasuní National Park, home to the world’s richest biodiversity, and indigenous peoples living in voluntary isolation. This proposal was supported by the Ecuadorean government. Ecuador would make a financial sacrifice for its own good and that of humanity. The country requested foreign contributions equivalent to half the money that would have been earned, some US$ 3.6 billion in total, paid in ten years. These contributions would be deposited in a UNDP trust fund and used for social investment, environmental reparations in oil areas, and the development of energy alternatives. Some money is arriving, but not fast enough. The Yasuni ITT initiative is now under serious threat of cancelation. When on May 24 President Correa starts his third term, some fear that he will break with the Yasuni ITT initiative and open the area for drilling. 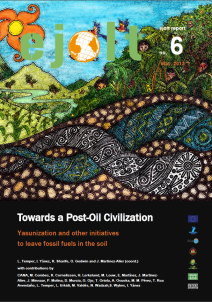 “Towards a Post Oil Civilization” gives a historical perspective from Ecuador and Nigeria and features cases from Colombia to Canada, from Italy to Spain and from Norway to New Zealand. The report also charts the rise of fracktivism: activism against the dangerous drilling technique called fracking. Glocal alliances for climate justice are formed by grassroots communities at both ends of the pipeline: North and South are joining hands. “Leaving the oil underground does not translate to losses but savings. We must learn to save. The oil under the soil is still our oil. We must not exploit every resource simply because we have it.” says Nnimmo Bassey from Oilwatch and Friends of the Earth Nigeria.